As Christmas season approaches, Chester and surrounding areas light up with activities to get you into the festive spirit. Some of the special seasonal events go on for days or weeks throughout the season, while others happen just once, so you’ll want to watch the calendar to get the most out of events this Christmas season in Chester. Throughout the seasons Chester offers diverse historical and cultural treasures that are unique, but during the Christmas season especially, Chester showcases the classic charm and pleasures of an enchanting English town. Stimulate your imagination within 15 acres of beautiful Cheshire woods come alive with mystery and delight in an amazing display of lights and sound to complete the sensory experience. Wander the paths through the woods and share the moments with friends and family, as you look for signs of the woods changing from fall to winter as the end of the year approaches. Open for exploration 20 Oct. through 2 Nov. 2018. From a late night shopping to set your season off right, to the Christmas Tree Lighting ceremony, Cheshire Oaks Designer Outlet provides seasonal activities throughout the months leading up to Christmas. Nov. 1 see’s the starts late night shopping and the Christmas season begins at Cheshire Oaks. Tree lighting festivities happen on Nov. 7. Radio City leads off a stellar launch to Christmas season at 6 p.m. and from 6:30 to 7:00 enjoy the sounds of The Hammond, a group from a local theatre school in Chester, as they sing carols that are known and loved by all. The beautiful and satisfying family film The Snowman screens with a live orchestra, for a family event all will appreciate. Master fireworks artists Blitz end the night with a sparkling display of fireworks accompanied by music for family enjoyment at 7:30pm. Watch the show light up the night sky and set your Christmas season off to a memorable start. Feel the spirit of Chester in the annual parade this Christmastime. Music and visual splendour light up the town as the parade passes through, bringing joy to kids and families along the way. The action starts at Chester Town Hall at 7pm on Friday 16 November and proceeds through the town in a colourful exuberant display of cheer of the season. You’ll find 70 classic wooden chalets arranged around the dazzling Christmas tree in the heart of Chester just adjacent to Chester Town Hall and Chester Cathedral. Outstanding products from many local vendors and creators are on display to inspire you with ideas and inspirations for stocking fillers and gifts from among the clothing, crafts, jewellery, and accessories as well as delights to eat and drink. Enjoy a break at the Real Ale Bar for festive drinks like seasonal cocktails and regional cask ale. 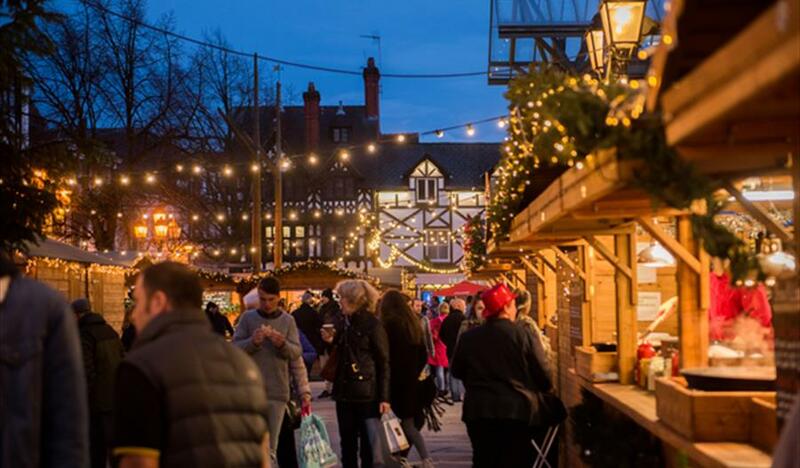 Wander with loved ones through the diverse range of shops, stop for a sip of hot chocolate or cider, marvel at the twinkling tree that sparkles with the magic of the season, and take in all the delights of the renowned Chester Christmas Market. The market towns of Cheshire offer even more of the unique blend of historical and modern cultures that make the region so charming. From Anglo-Saxon crosses to the boutiques and namesake markets where you can find the best of local produce and goods, discover treasures old and new. Tour the area by way of the Cheshire ring of canals that connect the towns with a longboat cruise of a day or more. Throughout the fall the towns light up with the sights and sounds of the season. Glide smoothly through the heart of Chester and take in the changes of the Christmas season with the festive flair of Cheshire. Discover a diverse array of botanical delights on display in one of Chester’s outstanding gardens. View plantings in an orderly oriental style throughout Tatton Park, relish the charm of distinctly English designs at Arley Hall & Gardens, and enjoy the horticultural riches at Ness Botanic Gardens. Grosvenor Park is 16 acres located alongside the River Dee with very fine and extensive Victorian-style design. Garden enthusiasts will find inspiration and ideas among the precisely designed gardens, and special events for the Christmas season are featured among the greenery as well, from music of the season to festive lights illuminating the cool long nights of fall. The Roman Gardens, just beyond the city walls close to the Newgate, to the south east of Chester, feature historical remnants of the Roman legion’s presence in what the area, which they called Dewa, around 60 AD. Fragments of the substantial city created by the Romans as a garrison for the troops who occupied the area are featured in the garden. Witness bits of history as you wander among artefacts found during excavations around Chester in the mid-20th century including the legionary headquarters, the old baths, and other significant buildings of the time. The columns are pieces from the original six-foot tall structural supports for the headquarters building’s assembly hall and from the exercise room of the Roman bath building, which featured running water to three separate rooms that were kept cold, hot, and warm, respectively. Chester Cathedral has watched over celebrations of Christmases in the city for 1,000 years. The stunning structure of red sandstone was founded during the Norman era, replacing an original church on the site. The Earl of Chester founded a Benedictine abbey in 1092, which was then consecrated in 1542 during the reign of Henry VIII and the Dissolution of the Monasteries that came during his time. Marvel at exquisite examples of the finest medieval carving in Europe and feel the spirit of the season as the cathedral takes on a festive air for events of the season. The annual Festival of Trees brings a forest of uniquely decorated Christmas trees to the Cathedral cloisters. Running through the Christmas season and into January, the trees provide inspiration and enjoyment for the entire family. Local organisations, from businesses to schools provide decorated trees done up around a theme unique to that tree to donate to the event, and visitors vote on favourites and contribute to great causes throughout the festival. Of course, music fills the Cathedral with the sounds of the season throughout the time leading up to Christmas. Performances of beloved carols accompany readings from seasonal texts in the Joyeux Noel concert by the Chester Cathedral Choir in December. Special services mark the coming holiday at the Cathedral as well, with the Blessing of the Trees and carols on Sunday Dec. 9, a crib service for the family on Christmas eve, and many more events throughout the season. The diverse range of festivities and special events happening throughout the Cheshire and in Chester this Christmas season provide plentiful opportunities to celebrate the holiday and soak up the rich historical atmosphere of the area. Wherever you begin your adventure, you are likely to find more opportunities nearby to take in sights and sounds of Christmas, shop for the just-right gifts, and lift your spirits with seasonal music and festive lights adorning the city. Parking in Chester can be difficult during peak seasonal periods, and the park and ride facilities are very handy during these periods (free busses every 10 minutes). If you are staying within Chester there are local busses, hop on hop off tourist busses, taxis in Chester can be booked or head off to one of many taxi ranks dotted around the city.